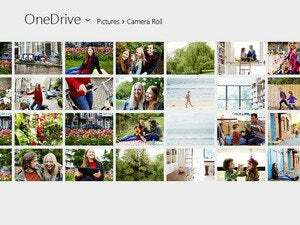 Addressing an issue often overlooked by cloud storage users when choosing a service, Microsoft has increased the maximum size for files uploaded to OneDrive from 2GB to 10GB. Although cloud storage providers now offer consumers massive amounts of space at little to no cost, the size limit on individual files can become a barrier for people who need to store very large files, especially in areas like media, science, architecture and engineering. Being able to store larger files has been one of the top requests from OneDrive users, Microsoft said in a blog post on Wednesday. “We recognized that people not only have more files than they did before, but they have bigger files as well,” wrote OneDrive group program manager Jason Moore. The larger files can be uploaded via the product’s desktop software for Windows and Mac OS, its mobile apps and OneDrive.com. On the consumer side, the move makes OneDrive more competitive with Dropbox, which has a 10GB limit for files uploaded from its website, and no limit on files uploaded via its desktop and mobile apps. Google Drive lets users upload files up to 5TB in size, as long as they’re not converted to Google Docs, Slides and Sheets. There is a 50MB file size limit on presentations and documents uploaded to Drive and converted to Docs and Slides, and a 100MB limit on spreadsheets converted to Sheets. Microsoft also said it has sped up OneDrive’s syncing process on PCs and Macs, making it approximately three times faster. The rollout of this improvement will be completed worldwide in the coming weeks. It’s also now possible for OneDrive users to drag and drop folders from their computers to OneDrive.com when using the Chrome browser. In addition, Windows 7 and Windows 8 users can now create a link to share files from their OneDrive folder without needing to do that on OneDrive.com. “By simply right-clicking the item or items you’d like to share, you’ll see a ‘Share a OneDrive link’ option that will create a sharing link and add it to your Clipboard. From there, you can paste it directly into an email, IM, or other message,” Moore wrote. This feature should be rolled out worldwide within the coming weeks, and available on Windows 8.1 and Mac OS at an unspecified later date.